Gigabyte has recently announced that its support for Intel® Thunderbolt™ 3 has expanded with the certification of its upcoming Gigabyte GA-X170-EXTREME ECC motherboard. 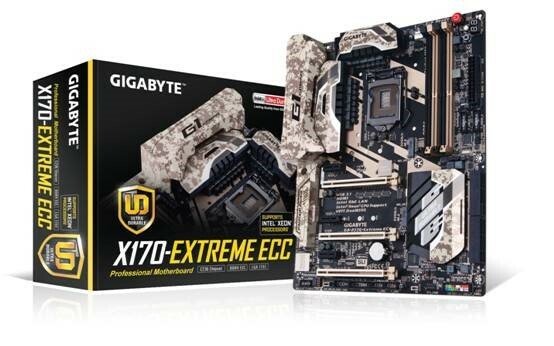 The Gigabyte GA-X170-EXTREME ECC motherboard is the world’s first C236 chipset board to receive Thunderbolt™ 3 certification from Intel, enabling full support for the fastest connectivity protocol on the planet. Compatible with Intel’s Xeon® E3-1200 v5 processor and DDR4 ECC (Error-correcting code) memory, the GA-X170-EXTREME ECC motherboard has what professionals need to do their best work. The addition of Thunderbolt™ 3 makes the motherboard a definite must-have for any high-end desktop system. Powered by Intel’s own Thunderbolt™ 3 controller, the new Thunderbolt™ 3 protocol, which is available over a USB Type-C™ connector on the back I/O of select Gigabyte motherboards including the GA-X170-EXTREME ECC, brings an unprecedented single-wire bandwidth of up to 40 Gb/s — twice more than the previous generation! Thunderbolt™ 3 over USB Type-C™ supports DisplayPort 1.2, which is able to drive a 4K resolution display at 60 FPS, and revolutionary industry-first features such as power delivery up to 36W, as well as the ability to daisy-chain up to 6 devices per USB Type-C port.